Active rehabilitation enables you to escape life long disability. Active rehabilitation gives you the opportunity to escape the chronic effects of a lower back injury. Frequent relapses is the rule unless you are prepared to go through the discipline of a daily exercise program. This page was last updated by Dr Barrie Lewis on 3rd December, 2018. The fundamental problem is that the pain decreases much faster than you heal. Simply because the sharp stabs have halved does not mean that the tissues have been restored by fifty percent. When one has a serious illness, such as pneumonia, a sense of malaise and weakness is the norm. You know that, despite the fact that breathing has returned to normal, the effect of the disease has not yet passed. One has no difficulty with the idea that a period of recuperation is important. But with severe lower back pain, one doesn't actually feel sick. And once the symptoms have reduced significantly, the temptation to get back into the fast lane too soon is very great. Then there's a relapse, often worse than the first episode, with sciatica radiating down the leg. It applies equally to a shoulder injury, or a sprained ankle. The soft tissues, and especially discs, ligaments and tendons have a poor blood supply and take longer to heal than bone, for example. Plus, unless you gently exercise the damaged part, a fibrotic scar forms, likely to rupture again. Active rehabilitation of an antalgic posture like this is paramount. Antalgia (ant + algia = away from the pain) is a reflex stance the body takes on to escape the pain and protect the nerve root; it's beyond your conscious control. Active rehabilitation is vital to prevent relapse. Usually the antalgic posture is away from the pain, but in the case of the postero medial disc herniation, then it's actually towards the agonising side. Slipped disc does not always produce an antalgic list like this; it's a very serious sign, and active rehabilitation is vital whether you go into this twisted posture or not. Let's consider this case. Five months ago this lady consulted us with acute lower back pain after heavy lifting. There was no pain in the leg, and it was her first incident. All the indications were of an acute disc injury at the L4 L5 joint. As you can see, she looks like the leaning tower of Pisa. This is what's known as a functional scoliosis, or antalgic posture. That means this is a temporary twist in the spine, and she will come upright once the bulge has been reduced. It usually takes about 3 days to a week, depending on numerous factors, and can certainly take longer if our slipped disc rules aren't rigidly adhered to. Some of them are controversial. In general, it has been clearly shown that prolonged bed rest hinders rather than helps lower back pain. However, patients with acute pain, and who are in an antalgic posture as she is, find they cannot stand for long, and with sitting the pressure in the ruptured disc increases dramatically; the bulging nucleus pulposis simply leaks back into the tear in the annulus fibrosis. The only feasible option is our modified bed rest with massage. You lie down, first on your back, and then on your side, doing the slipped disc exercises regularly, and getting up every hour. She responded extremely well to the chiropractic adjustment, taking the injury seriously. Within a week she was upright, and after two more pain free. She even quit the weed when I told her that the disc was unlikely to heal due to the lack of oxygen. Doctors report that smoking is the largest risk factor in so called failed back surgery, and it's a serious problem with chiropractic care too. However, there were four factors in the active rehabilitation of her back. Initially she took three of them very seriously which is why she recovered so quickly. She did the exercises faithfully. She wore a lift in her right shoe for her anatomically short leg. It's virtually impossible to lose weight and stop smoking simultaneously. She correctly chose the worse of the two evils. However, there was a problem with her rehabilitation program once the pain had abated. She developed a bad dose of the flu a few weeks later, cancelled her next appointment, and never resumed it. 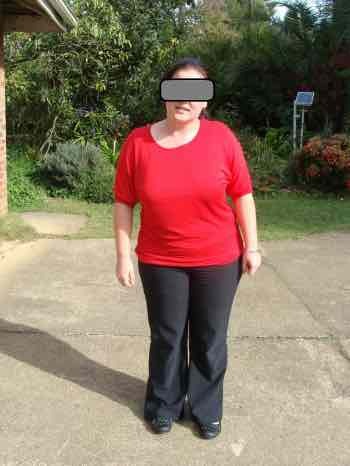 Within a month she stopped doing the exercises, and in fact never got on to the more advanced program, destined to be started once the condition has nearly healed. It was summertime, and the orthotic in her shoe didn't fit comfortably in her sandals. Thankfully she didn't start smoking again. In fact, her husband also quit, and on the basis of the savings they could afford a very nice new car. 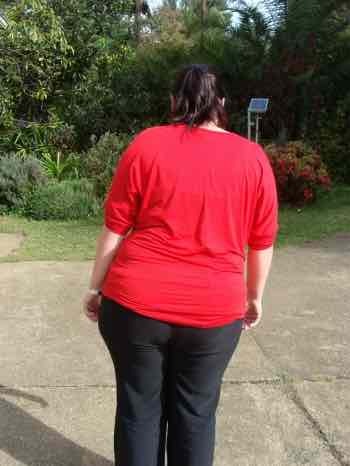 Five months after the first incident, she relapsed whilst doing a routine small job at her office. The above photos were taken just recently at the second episode. Is this a case of failed back chiropractic care? And how many cases of failed back surgery occur because the patient never took the active rehabilitation seriously? Despite the reduction of the disc with chiropractic manipulation it's almost certain that some of the nucleus is for ever lost. Repeated episodes mean loss of disc space and eventually the foramen where the nerve emerges becomes severely compromised. Take your active chiropractic rehabilitation seriously or you may find in the future you are suffering from lumbar spinal stenosis. It's not fun. Three days later she is up straight, but now comes six weeks of active rehabilitation, most of which she has to do; otherwise in a few months, this will happen again, each time small amounts of disc material are lost. She still has a deep ache but the sharp pain has stopped and the Slump test is negative once more. Chiropractic emphasises the need for active rehabilitation; repeated episodes leading to an antalgic posture inevitably lead to a complex prolapse of the disc, and nerve entrapment. Slipped disk - another angle. Go to slipped disc rules.